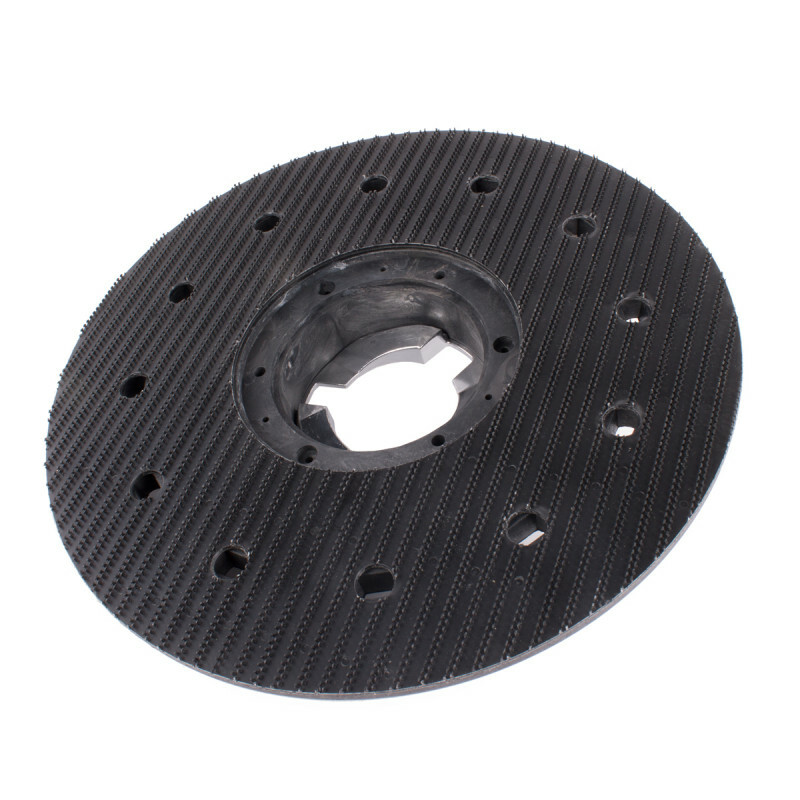 This 17" harpoon style pad holder comes with a universal clutch plate that will fit any of our standard 17" rotary floor buffers. The clutch plate itself has a 1" inch riser that drops the pad down below the floor buffer apron. The pad holder head contains looped harpoons that hold pads tight in a velcro style application. When measured across, the actual diameter of this diriver measures 16" across, but is designed this with to fir under the aprons of 17" floor buffers, and can be used with any 17 inch round carpet bonnets, floor polishing, scrubbing or stripping pads. For other sizes, and options, please take a look at our complete line of floor buffer pad holders. For light buffing to remove dirt, produces a high gloss shine. Removes dirt/scuff marks from heavily soiled floors. For heavy duty scrubbing or light stripping. Extra fine pad for polishing clean dry floors. For soft finishes and low traffic areas. Removes dirt and old finishes. For wet or dry stripping. Slightly less aggressive than black pads. Removes dirt and old finishes. For wet stripping only. More aggressive than brown pads. Customers who were interested in the 17" Pad Driver for 175 RPM Floor Buffers were also interested in the following items. Exactly what I needed! At a reasonable cost. Used for commercial cleaning on swing machine. Holds pad nicely, with no issues. Would buy again! We bought an old buffing machine and it didn't come with a pad driver. This fit our machine perfectly and does great. Just make sure you have a pad on it at all times or the velcro like bottom will flatten and no longer hold on to the pads. We use a total of 11 Floor Machines Daily with these pad holders for Sanding and Polishing and it the best we have used in over 10 years. Locks onto the machine smoothly and holds a pad well." This is a review for the 17" Pad Driver for 175 RPM Floor Buffers.